Conozca la historia del rancho y el área con un guía local experto. Su recorrido comenzará en el Rancho Kualoa, de 4,000 acres (1,619 hectáreas), ubicado en la costa norte de Oahu. Suba a bordo de un autobús de época con su guía para explorar el extenso rancho de ganado. Escuche los comentarios de su guía sobre la impresionante lista de películas que se han filmado en este panorama, como 50 First Dates, Tears of the Sun y Pearl Harbor, y programas de televisión como Lost y Hawaii Five-O. Vea dónde se llevó a cabo una persecución de dinosaurios en Jurassic Park y tome una fotografía de la huella gigante de Godzilla. Luego, se dirigirá a la Bahía de Kaneohe, a la Isla Mokoli'i (Sombrero de Chinaman) y a las impresionantes montañas de la Cordillera de Ko'olau, que se formaron después de la erupción del volcán Ko’olau hace más de 2,5 millones de años. Las aguas cristalinas de la Bahía de Kaneohe también son donde Johnny Depp navegó a bordo de la Venganza de la Reina Ana en Piratas del Caribe 4. Disfruta de las impresionantes vistas mientras pasas por el icónico fondo verde de la Cordillera Ko’olau. Al final de su recorrido, su guía lo llevará de regreso a su punto de partida original en el rancho. Our tour guide was exceptional! Nohea, she was funny, informative, and overall awesome! The sights were amazing, the views breathtaking. I enjoyed every moment. 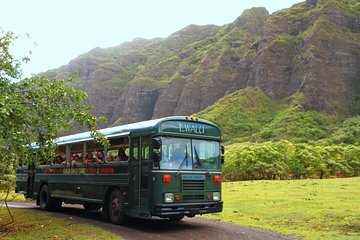 This was one of the best tours we took in Oahu. Our driver was wonderful, humorous and downright entertaining! Gorgeous views of mountainous Oahu, and fun excursions into various movie sets that were filmed here--Lost, Jumanji, Jurassic Park, etc. Wonderful family friendly tour!! This was so much better than we anticipated! Knowledgeable guide. Beautiful scenery. Fun! Great tour however its not really for little kids,Id say under 8... bus ride is really bumpy and its too boring for them. a great start to my holiday the staff is amazing theres so much to see on the Kualoa Ranch. Fun and the we got see a little bit of the King Kong - Skull Island film being made. The tour was really interesting and the history of the ranch was fascinating. The only thing we regretted was that we didn't sign up for more activities. There are enough separate tours and things to do you can spend most of the day there if you like. We were on a bus tour but you ride ATVs and do other things while you are there. This was awesome! Tour included military history of the ranch, movie sites, and current endeavors from cows to chocolate. Tour guide was knowledgeable and friendly. We stopped at the bunker for walk through, including an amazing view, movie/TV posters and props, and even a set leftover from Hawaii 5-0. Later stopped at the JP log for pictures. Driver also slows down to pause at the site of several other movie scenes, marked by signs and sometimes props like Godzilla's footprints or leftover boneyard from Kong:Skull Island. Definitely worth the money for movie lovers! Opportunity after the tour to visit the reasonably priced gift shop and grab lunch from burgers to loco moco. Great tour. Fascinating greens surrounding us from everywhere. It was amazing to see many movie locations there live. The remaining of Kong and Jurassic park spot were the best. The guide was very nice and friendly. He's very knowledgeable of the place. He knows the history quite well. We had plenty of time to take pictures throughout the tour. I greatly recommend it. Our driver was very good, he provided a lot of background history of the ranch and all the activities that had taken place there. We stopped at a couple of movies locations for photo ops. Excellent tour really enjoyed. it.